Does Anyone Even Care About the iPad Mini? Do you care about the iPad mini? Does anyone you know care? Rumor has it that the device will be announced on Oct. 17 and, when Apple does, the tablet will largely compete with the Amazon Kindle HD, the Barnes & Noble Nook HD and the Nexus 7. But does anyone even care about this highly-rumored, basically confirmed 7.85-inch iOS device? It doesn't seem so. I spent the last 12 months being bombarded with questions from friends and family members wondering if they should get the iPhone 5. Even when the iPhone 4S was announced I was asked by friends if they should "just wait for the next one." When the iPhone 4S launched, I recommended it. About 6 months later, I suggested they wait for the iPhone 5. But I haven't been asked once, not one single time whether or not someone should wait for the iPad mini. Sure, it has its own niche among Apple's products. It might still appeal to iPad owners who want a smaller device. If it comes in at a smaller price point, it will likely appeal to those who find the new iPad and the iPad 2 too expensive to purchase. And this whole editorial isn't to suggest that Apple won't sell millions of iPad minis, instead, it's just an observation that it seems there isn't any buzz among consumers about it. Here's a perfect example: I just attended two weddings last weekend. The iPhone 5, of course, was still the buzz. Those who know that I'm a mobile editor had plenty of questions. But it seemed that not a single person had the iPad mini on their radar. I wonder if they've even heard of it. As our own Brandon Russell mentioned in a conversation this morning, most people probably don't even know it's coming. Unlike the iPhone, consumers don't expect an iPad mini because it hasn't existed ever before. But, since we're all techies here, let's assume consumers have heard mention of the device. It has graced the headlines of The Wall Street Journal, after all. If consumers have heard of the device, why don't they care? From a consumer perspective, it seems like a perfectly compelling tablet that adds yet another way to consume Apple's massive ecosystem of apps, movies, books, TV shows and more. From a business perspective, it looks like Apple's about to take a large slice of the pie from several Android makers who have, so far, dominated the 7-inch tablet space. We have even posted several leaked parts of the upcoming iPad mini. Before the iPhone 5 launch, the web was loaded with discussion about every single leaked part (not just on TechnoBuffalo). There was a clear cloud of excitement around the device. There were wonderful discussions as to whether or not this device would best every other product out there. But those kind of conversations aren't really happening around the web. The conversation, once boiling, has simmered. 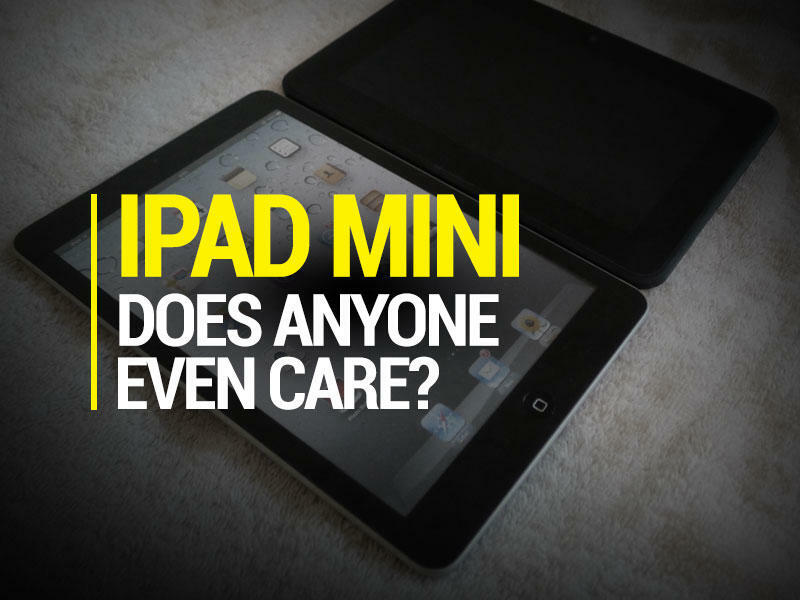 Do you care about the iPad mini?